Produktinformationen "Nise-300 - 4th Generation Intel® Core™ i5 - lüfterlos - 6x mini-PCIe"
The high performance NISE 300, which is integrated with 4th generation Intel® Core™ i5 processor and Lynx Point QM87 PCH, can provide outstanding system performance and presents a brand new opportunity for both intelligent and industrial computing solutions. NISE 300 supports up to 8G un-buffered and non-ECC DDR3/ DDR3L memory, CFast , SATAIII, the latest USB 3.0 technology. Support both +12 and +24 DC input and the operating temperature range is from -5 Celsius degree to 55 Celsius degree. NISE 300 comes with user-friendly I/O design; all I/O interfaces are at front panel and it makes system much easier to use and to expand the functionalities. It's mechanical design also fits with 2U 19” rack-mount dimension. 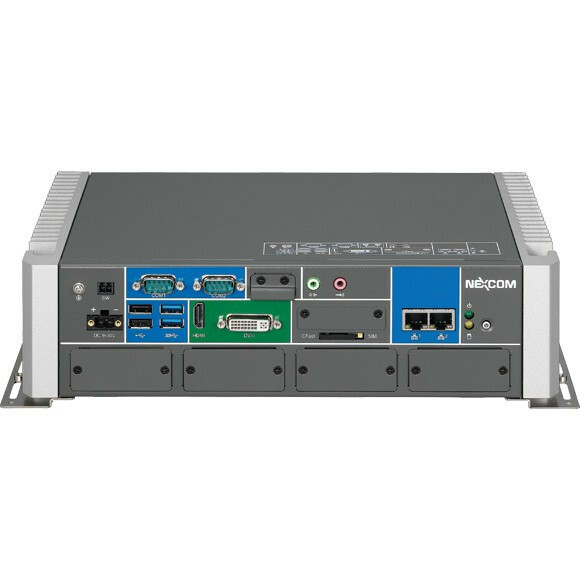 NISE 300 also integrates with 6 mini-PCIe sockets and 2 COM Port interfaces, which makes it a real versatile box for various applications such as factory automation applications (PROFIBUS, DEVICE NET, EtherCAT, PROFINET, Ethernet IP), network applications (GbE LAN, Wi-Fi, GSM), and storage devices (mSATA). With the latest features and flexible module expansions, NISE 300 is definitely the top choice for M2M intelligence and factory automation platforms. Weiterführende Links zu "Nise-300 - 4th Generation Intel® Core™ i5 - lüfterlos - 6x mini-PCIe"